Another dispatch from the world outside of the Internet to the world inside: STAY IN THERE! It’s awfully boring out here, and the natives are growing restless. I guess we’ll need a gatling or two at the fort’s gate. Foreshadowing can be done quite subtly and elegant, of course, but the b-movie way is doing it in a much more literal sense: If there’s a character whose identity is not yet to be disclosed, and who still needs to be shown doing something, you just show his dark silhouette or shadow on the wall. 1. It has to be the threatening shadow of Dr. Fu Manta, because the flick’s title is “The threatening Shadow of Dr. Fu Manta”. 2. The shadow speaks with the same thick German accent as the friendly and solicitous, yet vaguely disquieting German scientist the protagonists met two scenes earlier. 3. The silhouette shadowed against the girl’s bedroom walls is hunchbacked, has one leg that is too short, and one hand replaced with a primitive hook. Coincidentally, the creepy professor’s lab assistant displays exactly the same deformities. 4. The name of one of the actors is on the ‘Big List of Perennial Villains’, in which he has an automatic monopoly on all shadowy threats in the movie. This list encompasses Boris Karloff, Bela Lugosi, Christopher Lee, George Zucco and many, many others. 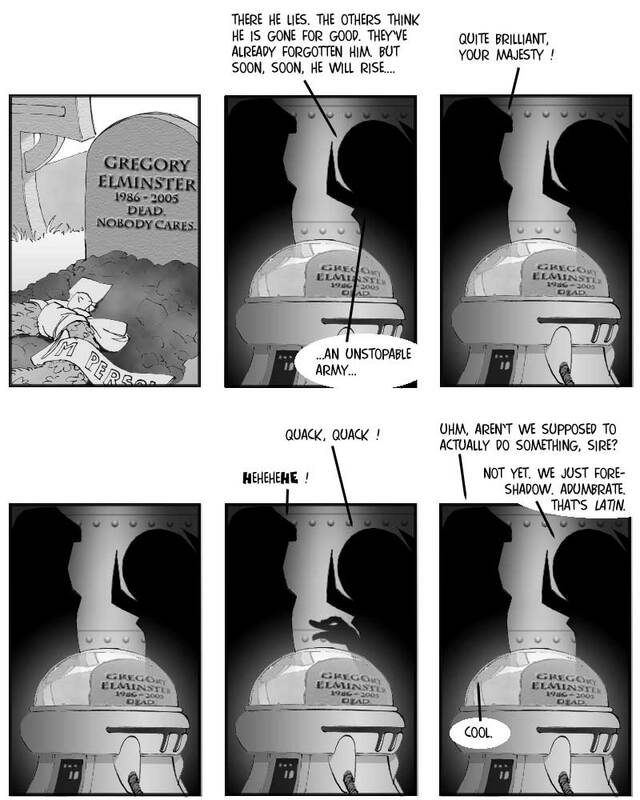 As regards Gregory’s epitaph, I admit it turned out a bit prosaic, but I’m just no good at these things. And I like concise epitaphs, anyway, like the one on Jewni Asew’s tombstone. Asew was the most successful and notorious double (or rather, triple) agents of the early 20th century, and his tombstone is inscribed only with his name – in code! Installation date for my Internet connection has been pushed back to Feb. 6th, and I have my doubts even about that…hoping for the best, though. Text: Adumbration, noun, derived from Latin ‘umbra’ = shadow, Foreshadowing.